A fluorescent lamp or a fluorescent tube is a low pressure mercury-vapor gas-discharge lamp that uses fluorescence to produce visible light. An electric current in the gas excites mercury vapor which produces short-wave ultraviolet light that then causes a phosphor coating on the inside of the lamp to glow. A fluorescent lamp converts electrical energy into useful light much more efficiently than incandescent lamps. The typical luminous efficacy of fluorescent lighting systems is 50–100 lumens per watt, several times the efficacy of incandescent bulbs with comparable light output, but less than that of a typical LED bulb. Fluorescent lamp fixtures are more costly than incandescent lamps because they require a ballast to regulate the current through the lamp, but the lower energy cost typically offsets the higher initial cost. Compact fluorescent lamps are now available in the same popular sizes as incandescents and are used as an energy-saving alternative in homes. Because they contain mercury, many fluorescent lamps are classified as hazardous waste. The United States Environmental Protection Agency recommends that fluorescent lamps be segregated from general waste for recycling or safe disposal, and some jurisdictions require recycling of them. Fluorescence of certain rocks and other substances had been observed for hundreds of years before its nature was understood. By the middle of the 19th century, experimenters had observed a radiant glow emanating from partially evacuated glass vessels through which an electric current passed. One of the first to explain it was the Irish scientist Sir George Stokes from the University of Cambridge, who named the phenomenon "fluorescence" after fluorite, a mineral many of whose samples glow strongly due to impurities. The explanation relied on the nature of electricity and light phenomena as developed by the British scientists Michael Faraday in the 1840s and James Clerk Maxwell in the 1860s. Little more was done with this phenomenon until 1856 when German glassblower Heinrich Geissler created a mercury vacuum pump that evacuated a glass tube to an extent not previously possible. Geissler invented the first gas-discharge lamp, the Geissler tube, consisting of a partially evacuated glass tube with a metal electrode at either end. When a high voltage was applied between the electrodes, the inside of the tube lit up with a glow discharge. By putting different chemicals inside, the tubes could be made to produce a variety of colors, and elaborate Geissler tubes were sold for entertainment. More important, however, was its contribution to scientific research. One of the first scientists to experiment with a Geissler tube was Julius Plücker who systematically described in 1858 the luminescent effects that occurred in a Geissler tube. He also made the important observation that the glow in the tube shifted position when in proximity to an electromagnetic field. Alexandre Edmond Becquerel observed in 1859 that certain substances gave off light when they were placed in a Geissler tube. He went on to apply thin coatings of luminescent materials to the surfaces of these tubes. Fluorescence occurred, but the tubes were very inefficient and had a short operating life. Inquiries that began with the Geissler tube continued as even better vacuums were produced. The most famous was the evacuated tube used for scientific research by William Crookes. That tube was evacuated by the highly effective mercury vacuum pump created by Hermann Sprengel. Research conducted by Crookes and others ultimately led to the discovery of the electron in 1897 by J. J. Thomson and X-rays in 1895 by Wilhelm Roentgen. But the Crookes tube, as it came to be known, produced little light because the vacuum in it was too good and thus lacked the trace amounts of gas that are needed for electrically stimulated luminescence. While Becquerel was interested primarily in conducting scientific research into fluorescence, Thomas Edison briefly pursued fluorescent lighting for its commercial potential. He invented a fluorescent lamp in 1896 that used a coating of calcium tungstate as the fluorescing substance, excited by X-rays, but although it received a patent in 1907, it was not put into production. As with a few other attempts to use Geissler tubes for illumination, it had a short operating life, and given the success of the incandescent light, Edison had little reason to pursue an alternative means of electrical illumination. Nikola Tesla made similar experiments in the 1890s, devising high-frequency powered fluorescent bulbs that gave a bright greenish light, but as with Edison's devices, no commercial success was achieved. Although Edison lost interest in fluorescent lighting, one of his former employees was able to create a gas-based lamp that achieved a measure of commercial success. In 1895 Daniel McFarlan Moore demonstrated lamps 2 to 3 meters (6.6 to 9.8 ft) in length that used carbon dioxide or nitrogen to emit white or pink light, respectively. As with future fluorescent lamps, they were considerably more complicated than an incandescent bulb. After years of work, Moore was able to extend the operating life of the lamps by inventing an electromagnetically controlled valve that maintained a constant gas pressure within the tube. Although Moore’s lamp was complicated, was expensive to install, and required very high voltages, it was considerably more efficient than incandescent lamps, and it produced a closer approximation to natural daylight than contemporary incandescent lamps. From 1904 onwards Moore’s lighting system was installed in a number of stores and offices. Its success contributed to General Electric’s motivation to improve the incandescent lamp, especially its filament. GE’s efforts came to fruition with the invention of a tungsten-based filament. The extended lifespan and improved efficacy of incandescent bulbs negated one of the key advantages of Moore’s lamp, but GE purchased the relevant patents in 1912. These patents and the inventive efforts that supported them were to be of considerable value when the firm took up fluorescent lighting more than two decades later. At about the same time that Moore was developing his lighting system, another American was creating a means of illumination that also can be seen as a precursor to the modern fluorescent lamp. This was the mercury-vapor lamp, invented by Peter Cooper Hewitt and patented in 1901 (US 682692 ; this patent number is frequently misquoted as US 889,692). Hewitt’s lamp glowed when an electric current was passed through mercury vapor at a low pressure. Unlike Moore’s lamps, Hewitt's were manufactured in standardized sizes and operated at low voltages. The mercury-vapor lamp was superior to the incandescent lamps of the time in terms of energy efficiency, but the blue-green light it produced limited its applications. It was, however, used for photography and some industrial processes. Mercury vapor lamps continued to be developed at a slow pace, especially in Europe, and by the early 1930s they received limited use for large-scale illumination. Some of them employed fluorescent coatings, but these were used primarily for color correction and not for enhanced light output. Mercury vapor lamps also anticipated the fluorescent lamp in their incorporation of a ballast to maintain a constant current. Cooper-Hewitt had not been the first to use mercury vapor for illumination, as earlier efforts had been mounted by Way, Rapieff, Arons, and Bastian and Salisbury. Of particular importance was the mercury vapor lamp invented by Küch in Germany. This lamp used quartz in place of glass to allow higher operating temperatures, and hence greater efficiency. Although its light output relative to electrical consumption was better than that of other sources of light, the light it produced was similar to that of the Cooper-Hewitt lamp in that it lacked the red portion of the spectrum, making it unsuitable for ordinary lighting. The next step in gas-based lighting took advantage of the luminescent qualities of neon, an inert gas that had been discovered in 1898 by isolation from the atmosphere. Neon glowed a brilliant red when used in Geissler tubes. By 1910, Georges Claude, a Frenchman who had developed a technology and a successful business for air liquefaction, was obtaining enough neon as a byproduct to support a neon lighting industry. While neon lighting was used around 1930 in France for general illumination, it was no more energy-efficient than conventional incandescent lighting. Neon tube lighting, which also includes the use of argon and mercury vapor as alternate gases, came to be used primarily for eye-catching signs and advertisements. Neon lighting was relevant to the development of fluorescent lighting, however, as Claude’s improved electrode (patented in 1915) overcame "sputtering", a major source of electrode degradation. Sputtering occurred when ionized particles struck an electrode and tore off bits of metal. Although Claude’s invention required electrodes with a lot of surface area, it showed that a major impediment to gas-based lighting could be overcome. The development of the neon light also was significant for the last key element of the fluorescent lamp, its fluorescent coating. In 1926 Jacques Risler received a French patent for the application of fluorescent coatings to neon light tubes. The main use of these lamps, which can be considered the first commercially successful fluorescents, was for advertising, not general illumination. This, however, was not the first use of fluorescent coatings; Becquerel had earlier used the idea and Edison used calcium tungstate for his unsuccessful lamp. Other efforts had been mounted, but all were plagued by low efficiency and various technical problems. Of particular importance was the invention in 1927 of a low-voltage “metal vapor lamp” by Friedrich Meyer, Hans-Joachim Spanner, and Edmund Germer, who were employees of a German firm in Berlin. A German patent was granted but the lamp never went into commercial production. All the major features of fluorescent lighting were in place at the end of the 1920s. 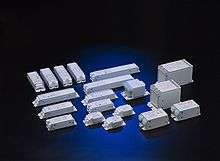 Decades of invention and development had provided the key components of fluorescent lamps: economically manufactured glass tubing, inert gases for filling the tubes, electrical ballasts, long-lasting electrodes, mercury vapor as a source of luminescence, effective means of producing a reliable electrical discharge, and fluorescent coatings that could be energized by ultraviolet light. At this point, intensive development was more important than basic research. In 1934, Arthur Compton, a renowned physicist and GE consultant, reported to the GE lamp department on successful experiments with fluorescent lighting at General Electric Co., Ltd. in Great Britain (unrelated to General Electric in the United States). Stimulated by this report, and with all of the key elements available, a team led by George E. Inman built a prototype fluorescent lamp in 1934 at General Electric’s Nela Park (Ohio) engineering laboratory. This was not a trivial exercise; as noted by Arthur A. 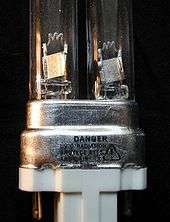 Bright, "A great deal of experimentation had to be done on lamp sizes and shapes, cathode construction, gas pressures of both argon and mercury vapor, colors of fluorescent powders, methods of attaching them to the inside of the tube, and other details of the lamp and its auxiliaries before the new device was ready for the public." In addition to having engineers and technicians along with facilities for R&D work on fluorescent lamps, General Electric controlled what it regarded as the key patents covering fluorescent lighting, including the patents originally issued to Hewitt, Moore, and Küch. More important than these was a patent covering an electrode that did not disintegrate at the gas pressures that ultimately were employed in fluorescent lamps. Albert W. Hull of GE’s Schenectady Research Laboratory filed for a patent on this invention in 1927, which was issued in 1931. General Electric used its control of the patents to prevent competition with its incandescent lights and probably delayed the introduction of fluorescent lighting by 20 years. Eventually, war production required 24-hour factories with economical lighting and fluorescent lights became available. While the Hull patent gave GE a basis for claiming legal rights over the fluorescent lamp, a few months after the lamp went into production the firm learned of a U.S. patent application that had been filed in 1927 for the aforementioned "metal vapor lamp" invented in Germany by Meyer, Spanner, and Germer. The patent application indicated that the lamp had been created as a superior means of producing ultraviolet light, but the application also contained a few statements referring to fluorescent illumination. Efforts to obtain a U.S. patent had met with numerous delays, but were it to be granted, the patent might have caused serious difficulties for GE. At first, GE sought to block the issuance of a patent by claiming that priority should go to one of their employees, Leroy J. Buttolph, who according to their claim had invented a fluorescent lamp in 1919 and whose patent application was still pending. GE also had filed a patent application in 1936 in Inman’s name to cover the “improvements” wrought by his group. In 1939 GE decided that the claim of Meyer, Spanner, and Germer had some merit, and that in any event a long interference procedure was not in their best interest. They therefore dropped the Buttolph claim and paid $180,000 to acquire the Meyer, et al. application, which at that point was owned by a firm known as Electrons, Inc. The patent was duly awarded in December 1939. This patent, along with the Hull patent, put GE on what seemed to be firm legal ground, although it faced years of legal challenges from Sylvania Electric Products, Inc., which claimed infringement on patents that it held. Even though the patent issue would not be completely resolved for many years, General Electric’s strength in manufacturing and marketing gave it a pre-eminent position in the emerging fluorescent light market. Sales of "fluorescent lumiline lamps" commenced in 1938 when four different sizes of tubes were put on the market. They were used in fixtures manufactured by three leading corporations, Lightolier, Artcraft Fluorescent Lighting Corporation, and Globe Lighting. The Slimline fluorescent ballast's public introduction in 1946 was by Westinghouse and General Electric and Showcase/Display Case fixtures were introduced by Artcraft Fluorescent Lighting Corporation in 1946. During the following year, GE and Westinghouse publicized the new lights through exhibitions at the New York World’s Fair and the Golden Gate International Exposition in San Francisco. Fluorescent lighting systems spread rapidly during World War II as wartime manufacturing intensified lighting demand. By 1951 more light was produced in the United States by fluorescent lamps than by incandescent lamps. In the first years zinc orthosilicate with varying content of beryllium was used as greenish phosphor. Small additions of magnesium tungstate improved the blue part of the spectrum yielding acceptable white. After it was discovered that beryllium was toxic, halophosphate based phosphors took over. The fundamental means for conversion of electrical energy into radiant energy in a fluorescent lamp relies on inelastic scattering of electrons when an incident electron collides with an atom in the gas. If the (incident) free electron has enough kinetic energy, it transfers energy to the atom's outer electron, causing that electron to temporarily jump up to a higher energy level. The collision is 'inelastic' because a loss of kinetic energy occurs. This higher energy state is unstable, and the atom will emit an ultraviolet photon as the atom's electron reverts to a lower, more stable, energy level. Most of the photons that are released from the mercury atoms have wavelengths in the ultraviolet (UV) region of the spectrum, predominantly at wavelengths of 253.7 and 185 nanometers (nm). These are not visible to the human eye, so they must be converted into visible light. This is done by making use of fluorescence. Ultraviolet photons are absorbed by electrons in the atoms of the lamp's interior fluorescent coating, causing a similar energy jump, then drop, with emission of a further photon. The photon that is emitted from this second interaction has a lower energy than the one that caused it. The chemicals that make up the phosphor are chosen so that these emitted photons are at wavelengths visible to the human eye. The difference in energy between the absorbed ultra-violet photon and the emitted visible light photon goes toward heating up the phosphor coating. When the light is turned on, the electric power heats up the cathode enough for it to emit electrons (thermionic emission). These electrons collide with and ionize noble gas atoms inside the bulb surrounding the filament to form a plasma by the process of impact ionization. As a result of avalanche ionization, the conductivity of the ionized gas rapidly rises, allowing higher currents to flow through the lamp. 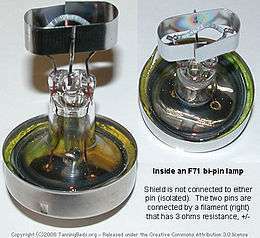 The fill gas helps determine the operating electrical characteristics of the lamp, but does not give off light itself. The fill gas effectively increases the distance that electrons travel through the tube, which allows an electron a greater chance of interacting with a mercury atom. Argon atoms, excited to a metastable state by impact of an electron, can impart this energy to a neutral mercury atom and ionize it, described as the Penning effect. This has the benefit of lowering the breakdown and operating voltage of the lamp, compared to other possible fill gases such as krypton. A fluorescent lamp tube is filled with a gas containing low pressure mercury vapor and argon, xenon, neon, or krypton. The pressure inside the lamp is around 0.3% of atmospheric pressure. The inner surface of the lamp is coated with a fluorescent (and often slightly phosphorescent) coating made of varying blends of metallic and rare-earth phosphor salts. The lamp's electrodes are typically made of coiled tungsten and usually referred to as cathodes because of their prime function of emitting electrons. For this, they are coated with a mixture of barium, strontium and calcium oxides chosen to have a low thermionic emission temperature. A germicidal lamp uses a low pressure mercury vapor glow discharge identical to that in a fluorescent lamp, but the germicidal lamp uses an uncoated fused quartz envelope so the ultraviolet radiation can escape. Fluorescent lamp tubes are typically straight and range in length from about 100 millimeters (3.9 in) for miniature lamps, to 2.43 meters (8.0 ft) for high-output lamps. Some lamps have the tube bent into a circle, used for table lamps or other places where a more compact light source is desired. Larger U-shaped lamps are used to provide the same amount of light in a more compact area, and are used for special architectural purposes. Compact fluorescent lamps have several small-diameter tubes joined in a bundle of two, four, or six, or a small diameter tube coiled into a helix, to provide a high amount of light output in little volume. Fluorescent lamps are negative differential resistance devices, so as more current flows through them, the electrical resistance of the fluorescent lamp drops, allowing for even more current to flow. Connected directly to a constant-voltage power supply, a fluorescent lamp would rapidly self-destruct due to the uncontrolled current flow. To prevent this, fluorescent lamps must use an auxiliary device, a ballast, to regulate the current flow through the lamp. The terminal voltage across an operating lamp varies depending on the arc current, tube diameter, temperature, and fill gas. A fixed part of the voltage drop is due to the electrodes. A general lighting service 48-inch (1,219 mm) T12 lamp operates at 430 mA, with 100 volts drop. High output lamps operate at 800 mA, and some types operate up to 1.5 A. The power level varies from 33 to 82 watts per meter of tube length (10 to 25 W/ft) for T12 lamps. The simplest ballast for alternating current (AC) use is an inductor placed in series, consisting of a winding on a laminated magnetic core. The inductance of this winding limits the flow of AC current. This type is still used, for example, in 120 volt operated desk lamps using relatively short lamps. Ballasts are rated for the size of lamp and power frequency. Where the AC voltage is insufficient to start long fluorescent lamps, the ballast is often a step-up autotransformer with substantial leakage inductance (so as to limit the current flow). Either form of inductive ballast may also include a capacitor for power factor correction. Many different circuits have been used to operate fluorescent lamps. The choice of circuit is based on AC voltage, tube length, initial cost, long term cost, instant versus non-instant starting, temperature ranges and parts availability, etc. Fluorescent lamps can run directly from a direct current (DC) supply of sufficient voltage to strike an arc. The ballast must be resistive, and would consume about as much power as the lamp. 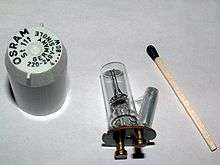 When operated from DC, the starting switch is often arranged to reverse the polarity of the supply to the lamp each time it is started; otherwise, the mercury accumulates at one end of the tube. Fluorescent lamps are (almost) never operated directly from DC for those reasons. Instead, an inverter converts the DC into AC and provides the current-limiting function as described below for electronic ballasts. The light output and performance of fluorescent lamps is critically affected by the temperature of the bulb wall and its effect on the partial pressure of mercury vapor within the lamp. Each lamp contains a small amount of mercury, which must vaporize to support the lamp current and generate light. At low temperatures the mercury is in the form of dispersed liquid droplets. As the lamp warms, more of the mercury is in vapor form. At higher temperatures, self-absorption in the vapor reduces the yield of UV and visible light. Since mercury condenses at the coolest spot in the lamp, careful design is required to maintain that spot at the optimum temperature, around 40 °C (104 °F). By using an amalgam with some other metal, the vapor pressure is reduced and the optimum temperature range extended upward; however, the bulb wall "cold spot" temperature must still be controlled to prevent migration of the mercury out of the amalgam and condensing on the cold spot. Fluorescent lamps intended for higher output will have structural features such as a deformed tube or internal heat-sinks to control cold spot temperature and mercury distribution. Heavily loaded small lamps, such as compact fluorescent lamps, also include heat-sink areas in the tube to maintain mercury vapor pressure at the optimum value. A Sankey diagram of energy losses in a fluorescent lamp. In modern designs, the biggest loss is the quantum efficiency of converting high-energy UV photons to lower-energy visible light photons. Only a fraction of the electrical energy input into a lamp is converted to useful light. The ballast dissipates some heat; electronic ballasts may be around 90% efficient. A fixed voltage drop occurs at the electrodes, which also produces heat. Some of the energy in the mercury vapor column is also dissipated, but about 85% is turned into visible and ultraviolet light. The UV light is absorbed by the lamp's fluorescent coating, which re-radiates the energy at longer wavelengths to emit visible light. Not all the UV energy striking the phosphor gets converted into visible light. In a modern lamp, for every 100 incident photons of UV impacting the phosphor, only 86 visible light photons are emitted (a quantum efficiency of 86%). The largest single loss in modern lamps is due to the lower energy of each photon of visible light, compared to the energy of the UV photons that generated them (a phenomenon called Stokes shift). Incident photons have an energy of 5.5 electron volts but produce visible light photons with energy around 2.5 electron volts, so only 45% of the UV energy is used; the rest is dissipated as heat. If a so-called "two-photon" phosphor could be developed, this would improve the efficiency but much research has not yet found such a system. Most fluorescent lamps use electrodes that operate by thermionic emission, meaning they are operated at a high enough temperature for the electrode material (usually aided by a special coating) to emit electrons into the tube by heat. However, there are also tubes that operate in cold cathode mode, whereby electrons are liberated into the tube only by the large potential difference (voltage) between the electrodes. This does not mean the electrodes are cold (indeed, they can be very hot), but it does mean they are operating below their thermionic emission temperature. Because cold cathode lamps have no thermionic emission coating to wear out they can have much longer lives than hot cathode tubes. This quality makes them desirable for maintenance-free long-life applications (such as backlights in liquid crystal displays). Sputtering of the electrode may still occur, but electrodes can be shaped (e.g. into an internal cylinder) to capture most of the sputtered material so it is not lost from the electrode. Cold cathode lamps are generally less efficient than thermionic emission lamps because the cathode fall voltage is much higher. The increased fall voltage results in more power dissipation at tube ends, which does not contribute to light output. However, this is less significant with longer tubes. The increased power dissipation at tube ends also usually means cold cathode tubes have to be run at a lower loading than their thermionic emission equivalents. Given the higher tube voltage required anyway, these tubes can easily be made long, and even run as series strings. They are better suited for bending into special shapes for lettering and signage, and can also be instantly switched on or off. The noble gas used in the fluorescent tube (commonly argon) must be ionized before the arc can "strike" within the tube. For small lamps, it does not take much voltage to strike the arc and starting the lamp presents no problem, but larger tubes require a substantial voltage (in the range of a thousand volts). Starting a preheat lamp. The automatic starter switch flashes orange each time it attempts to start the lamp. This technique uses a combination filament–cathode at each end of the lamp in conjunction with a mechanical or automatic (bi-metallic) switch (see circuit diagram to the right) that initially connect the filaments in series with the ballast to preheat them; when the arc is struck the filaments are disconnected. This system is described as preheat in some countries and switchstart in others. These systems are standard equipment in 200–240 V countries (and for 100–120 V lamps up to about 30 watts). Before the 1960s four-pin thermal starters and manual switches were used. A mechanism then widely used for preheating, still in common use, is a glow switch starter (illustrated). It consists of a normally open bi-metallic switch in a small sealed gas-discharge lamp containing inert gas (neon or argon). When power is first applied to the circuit, there will be a glow discharge across the electrodes in the starter lamp. This heats the gas in the starter and causes one of the bi-metallic contacts to bend towards the other. When the contacts touch, the two filaments of the fluorescent lamp and the ballast will effectively be switched in series to the supply voltage. The current through the filaments causes them to heat up and emit electrons into the tube gas by thermionic emission. In the starter, the touching contacts short out the voltage sustaining the glow discharge, extinguishing it so the gas cools down and no longer heats the bi-metallic switch, which opens within a second or two. The current through the filaments and the inductive ballast is abruptly interrupted, leaving the full line voltage applied between the filaments at the ends of the tube and generating an inductive kick which provides the high voltage needed to start the lamp. 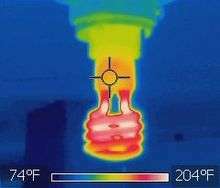 The lamp will fail to strike if the filaments are not hot enough, in which case the cycle repeats; several cycles are usually needed, which causes flickering and clicking during starting (older thermal starters behaved better in this respect). A power factor correction (PFC) capacitor draws leading current from the mains to compensate for the lagging current drawn by the lamp circuit. Once the tube strikes, the impinging main discharge keeps the cathodes hot, permitting continued electron emission without the need for the filaments to continue to be heated. The starter switch does not close again because the voltage across the lit tube is insufficient to start a glow discharge in the starter. With automated starters such as glow starters, a failing tube will cycle endlessly, flickering as the lamp quickly goes out because the emission mix is insufficient to keep the lamp current high enough to keep the glow starter open. This runs the ballast at higher temperature. Some more advanced starters time out in this situation, and do not attempt repeated starts until power is reset. Some older systems used a thermal over-current trip to detect repeated starting attempts and disable the circuit until manually reset. 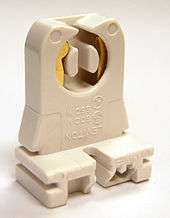 The switch contacts in glow starters are subject to wear and inevitably fail eventually, so the starter is manufactured as a plug-in replaceable unit. More recently introduced electronic starters use a different method to preheat the cathodes. They may be designed to be plug-in interchangeable with glow starters for use in standard fittings. They commonly use a purpose-designed semiconductor switch and "soft start" the lamp by preheating the cathodes before applying a controlled starting pulse which strikes the lamp first time without flickering; this dislodges a minimal amount of material from the cathodes during starting, giving longer lamp life than possible with the uncontrolled impulses to which the lamp is subjected in a switchstart. This is claimed to prolong lamp life by a factor of typically 3 to 4 times for a lamp frequently switched on as in domestic use, and to reduce the blackening of the ends of the lamp typical of fluorescent tubes. The circuit is typically complex, but the complexity is built into the IC. Electronic starters may be optimized for fast starting (typical start time of 0.3 seconds), or for most reliable starting even at low temperatures and with low supply voltages, with a startup time of 2–4 seconds. The faster-start units may produce audible noise during start-up. Electronic starters only attempt to start a lamp for a short time when power is initially applied, and do not repeatedly attempt to restrike a lamp that is dead and unable to sustain an arc; some automatically shut down a failed lamp. This eliminates the re-striking of a lamp and the continuous flickering of a failing lamp with a glow starter. Electronic starters are not subject to wear and do not need replacing periodically, although they may fail like any other electronic circuit. Manufacturers typically quote lives of 20 years, or as long as the light fitting. Starters are inexpensive, typically less than 50 US cents for the short-lived glow type (depending upon lamp power), and perhaps ten times more for the electronic type as of 2013. Another type of tube does not have filaments to start it at all. Instant start fluorescent tubes simply use a high enough voltage to break down the gas and mercury column and thereby start arc conduction. These tubes can be identified by a single pin at each end of the tube. The lamp holders have a "disconnect" socket at the low-voltage end which disconnects the ballast when the tube is removed, to prevent electric shock. Low-cost lighting fixtures with an integrated electronic ballast use instant start on lamps originally designed for preheating, although it shortens lamp life. Newer rapid start ballast designs provide filament power windings within the ballast; these rapidly and continuously warm the filaments/cathodes using low-voltage AC. Usually operating at a lower arc voltage than the instant start design; no inductive voltage spike is produced for starting, so the lamps must be mounted near a grounded (earthed) reflector to allow the glow discharge to propagate through the tube and initiate the arc discharge. In some lamps a grounded "starting aid" strip is attached to the outside of the lamp glass. Quick-start ballasts use a small auto-transformer to heat the filaments when power is first applied. When an arc strikes, the filament heating power is reduced and the tube will start within half a second. The auto-transformer is either combined with the ballast or may be a separate unit. Tubes need to be mounted near an earthed metal reflector in order for them to strike. Quick-start ballasts are more common in commercial installations because of lower maintenance costs. A quick-start ballast eliminates the need for a starter switch, a common source of lamp failures. Nonetheless, Quick-start ballasts are also used in domestic (residential) installations because of the desirable feature that a Quick-start ballast light turns on nearly immediately after power is applied (when a switch is turned on). Quick-start ballasts are used only on 240 V circuits and are designed for use with the older, less efficient T12 tubes. The semi-resonant start circuit was invented by Thorn Lighting for use with T12 fluorescent tubes. This method uses a double wound transformer and a capacitor. With no arc current, the transformer and capacitor resonate at line frequency and generate about twice the supply voltage across the tube, and a small electrode heating current. This tube voltage is too low to strike the arc with cold electrodes, but as the electrodes heat up to thermionic emission temperature, the tube striking voltage falls below that of the ringing voltage, and the arc strikes. As the electrodes heat, the lamp slowly, over three to five seconds, reaches full brightness. As the arc current increases and tube voltage drops, the circuit provides current limiting. Semi-resonant start circuits are mainly restricted to use in commercial installations because of the higher initial cost of circuit components. However, there are no starter switches to be replaced and cathode damage is reduced during starting making lamps last longer, reducing maintenance costs. Due to the high open circuit tube voltage, this starting method is particularly good for starting tubes in cold locations. Additionally, the circuit power factor is almost 1.0, and no additional power factor correction is needed in the lighting installation. As the design requires that twice the supply voltage must be lower than the cold-cathode striking voltage (or the tubes would erroneously instant-start), this design cannot be used with 240 volt AC power unless the tubes are at least 1.2 m (3 ft 11 in) length. Semi-resonant start fixtures are generally incompatible with energy saving T8 retrofit tubes, because such tubes have a higher starting voltage than T12 lamps and may not start reliably, especially in low temperatures. Recent proposals in some countries to phase out T12 tubes will reduce the application of this starting method. 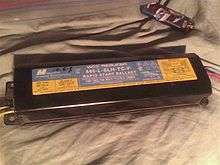 This is used with electronic ballasts shown below. A programmed-start ballast is a more advanced version of rapid start. This ballast applies power to the filaments first, then after a short delay to allow the cathodes to preheat, applies voltage to the lamps to strike an arc. This ballast gives the best life and most starts from lamps, and so is preferred for applications with very frequent power cycling such as vision examination rooms and restrooms with a motion detector switch. 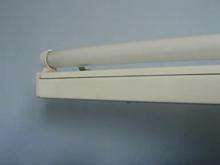 Fluorescent lamp with an electronic ballast. Electronic ballasts employ transistors to change the supply frequency into high-frequency AC while also regulating the current flow in the lamp. Some still use an inductance to limit the current, but the higher frequency allows a much smaller inductance to be used. Others use a capacitor-transistor combination to replace the inductor, since a transistor and capacitor working together can simulate the action of an inductor. These ballasts take advantage of the higher efficacy of lamps operated with higher-frequency current, which rises by almost 10% at 10 kHz, compared to efficacy at normal power frequency. When the AC period is shorter than the relaxation time to de-ionize mercury atoms in the discharge column, the discharge stays closer to optimum operating condition. Electronic ballasts typically work in rapid start or instant start mode. Electronic ballasts are commonly supplied with AC power, which is internally converted to DC and then back to a variable frequency AC waveform. Depending upon the capacitance and the quality of constant-current pulse-width modulation, this can largely eliminate modulation at 100 or 120 Hz. Low cost ballasts mostly contain only a simple oscillator and series resonant LC circuit. When turned on, the oscillator starts, and resonant current excites the LC circuit. This resonant current directly drives a switching transistor through a ring core transformer. This principle is called the current resonant inverter circuit. After a short time the voltage across the lamp reaches about 1 kV and the lamp ignites. The process is too fast to preheat the cathodes, so the lamp instant-starts in cold cathode mode. The cathode filaments are still used for protection of the ballast from overheating if the lamp does not ignite. A few manufacturers use positive temperature coefficient (PTC) thermistors to disable instant starting and give some time to preheat the filaments. More complex electronic ballasts use programmed start. The output frequency is started above the resonance frequency of the output circuit of the ballast; and after the filaments are heated, the frequency is rapidly decreased. If the frequency approaches the resonant frequency of the ballast, the output voltage will increase so much that the lamp will ignite. If the lamp does not ignite, an electronic circuit stops the operation of the ballast. Many electronic ballasts are controlled by a microcontroller or similar, and these are sometimes called digital ballasts. Digital ballasts can apply quite complex logic to lamp starting and operation. This enables functions such as testing for broken electrodes and missing tubes before attempting to start, auto detect tube replacement, and auto detection of tube type, such that a single ballast can be used with several different tubes, even those that operate at different arc currents, etc. Once such fine grained control over the starting and arc current is achievable, features such as dimming, and having the ballast maintain a constant light level against changing sunlight contribution are all easily included in the embedded microcontroller software, and can be found in various manufacturers' products. Since introduction in the 1990s, high-frequency ballasts have been used in general lighting fixtures with either rapid start or pre-heat lamps. These ballasts convert the incoming power to an output frequency in excess of 20 kHz. This increases lamp efficiency. These are used in several applications, including new generation tanning lamp systems, whereby a 100 watt lamp (e.g., F71T12BP) can be lit using 90 watts of actual power while obtaining the same luminous flux (measured in lumens) as magnetic ballasts. These ballasts operate with voltages that can be almost 600 volts, requiring some consideration in housing design, and can cause a minor limitation in the length of the wire leads from the ballast to the lamp ends. Closeup of the filament on a low pressure mercury gas discharge lamp showing white thermionic emission mix coating on the central portion of the coil acting as hot cathode. Typically made of a mixture of barium, strontium and calcium oxides, the coating is sputtered away through normal use, often eventually resulting in lamp failure. The "emission mix" on the lamp filaments/cathodes is required to enable electrons to pass into the gas via thermionic emission at the lamp operating voltages used. The mix is slowly sputtered off by bombardment with electrons and mercury ions during operation, but a larger amount is sputtered off each time the lamp is started with cold cathodes. The method of starting the lamp has a significant impact on this. Lamps operated for typically less than 3 hours each switch-on will normally run out of the emission mix before other parts of the lamp fail. The sputtered emission mix forms the dark marks at the lamp ends seen in old lamps. When all the emission mix is gone, the cathode cannot pass sufficient electrons into the gas fill to maintain the gas discharge at the designed lamp operating voltage. Ideally, the control gear should shut down the lamp when this happens. However, due to cost, negative differential resistance and sometimes high starting voltage, some control gear will provide sufficient increased operating voltage to continue lighting the lamp in cold cathode mode. This will cause overheating of the lamp end and rapid disintegration of the electrodes (filament goes open-circuit) and filament support wires until they are completely gone or the glass cracks, wrecking the low pressure gas fill and stopping the gas discharge. This may occur in compact fluorescent lamps with integral electrical ballasts or in linear lamps. Ballast electronics failure is a somewhat random process that follows the standard failure profile for any electronic device. There is an initial small peak of early failures, followed by a drop and steady increase over lamp life. Life of electronics is heavily dependent on operating temperature—it typically halves for each 10 °C temperature rise. The quoted average life of a lamp is usually at 25 °C (77 °F) ambient (this may vary by country). The average life of the electronics at this temperature is normally greater than this, so at this temperature, not many lamps will fail due to failure of the electronics. In some fittings, the ambient temperature could be well above this, in which case failure of the electronics may become the predominant failure mechanism. Similarly, running a compact fluorescent lamp base-up will result in hotter electronics, which can cause shorter average life (particularly with higher power rated ones). Electronic ballasts should be designed to shut down the tube when the emission mix runs out as described above. In the case of integral electronic ballasts, since they never have to work again, this is sometimes done by having them deliberately burn out some component to permanently cease operation. In most CFLs the filaments are connected in series, with a small capacitor between them. The discharge, once lit, is in parallel to the capacitor and presents a lower-resistance path, effectively shorting the capacitor out. The phosphor drops off in efficiency during use. By around 25,000 operating hours, it will typically be half the brightness of a new lamp (although some manufacturers claim much longer half-lives for their lamps). Lamps that do not suffer failures of the emission mix or integral ballast electronics will eventually develop this failure mode. They still work, but have become dim and inefficient. The process is slow, and often becomes obvious only when a new lamp is operating next to an old one. As in all mercury-based gas-filled tubes, mercury is slowly adsorbed into the glass, phosphor, and tube electrodes throughout the life of the lamp, until it can no longer function. Loss of mercury will take over from failure of the phosphor in some lamps. The failure symptoms are similar, except loss of mercury initially causes an extended run-up time to full light output, and finally causes the lamp to glow a dim pink when the mercury runs out and the argon base gas takes over as the primary discharge. Subjecting the tube to asymmetric waveforms, where the total current flow through the tube does not cancel out and the tube effectively operates under a DC bias, causes asymmetric distribution of mercury ions along the tube due to cataphoresis. The localized depletion of mercury vapor pressure manifests as pink luminescence of the base gas in the vicinity of one of the electrodes, and the operating lifetime of the lamp may be dramatically shortened. This can be an issue with some poorly designed inverters. The filaments can burn out (fail) at the end of the lamp's lifetime, opening the circuit and losing the capability to heat up. Both filaments lose function as they are connected in series, with just a simple switch start circuit a broken filament will render the lamp completely useless. Filaments rarely burn out or fail open circuit unless the filament becomes depleted of emitter and the control gear is able to supply a high enough voltage across the tube to operate it in cold cathode mode. Some digital electronic ballasts are capable of detecting broken filaments and can still strike an arc with one or both filaments broken providing there is still sufficient emitter. A broken filament in a lamp attached to a magnetic ballast often causes both lamps to burn out or flicker. The spectrum of light emitted from a fluorescent lamp is the combination of light directly emitted by the mercury vapor, and light emitted by the phosphorescent coating. The spectral lines from the mercury emission and the phosphorescence effect give a combined spectral distribution of light that is different from those produced by incandescent sources. The relative intensity of light emitted in each narrow band of wavelengths over the visible spectrum is in different proportions compared to that of an incandescent source. Colored objects are perceived differently under light sources with differing spectral distributions. For example, some people find the color rendition produced by some fluorescent lamps to be harsh and displeasing. A healthy person can sometimes appear to have an unhealthy skin tone under fluorescent lighting. The extent to which this phenomenon occurs is related to the light's spectral composition, and may be gauged by its color rendering index (CRI). Correlated color temperature (CCT) is a measure of the "shade" of whiteness of a light source compared with a blackbody. Typical incandescent lighting is 2700 K, which is yellowish-white. Halogen lighting is 3000 K. Fluorescent lamps are manufactured to a chosen CCT by altering the mixture of phosphors inside the tube. Warm-white fluorescents have CCT of 2700 K and are popular for residential lighting. Neutral-white fluorescents have a CCT of 3000 K or 3500 K. Cool-white fluorescents have a CCT of 4100 K and are popular for office lighting. Daylight fluorescents have a CCT of 5000 K to 6500 K, which is bluish-white. High CCT lighting generally requires higher light levels. At dimmer illumination levels, the human eye perceives lower color temperatures as more pleasant, as related through the Kruithof curve. So, a dim 2700 K incandescent lamp appears comfortable and a bright 5000 K lamp also appears natural, but a dim 5000 K fluorescent lamp appears too pale. Daylight-type fluorescents look natural only if they are very bright. Color rendering index (CRI) is a measure of how well colors can be perceived using light from a source, relative to light from a reference source such as daylight or a blackbody of the same color temperature. By definition, an incandescent lamp has a CRI of 100. Real-life fluorescent tubes achieve CRIs of anywhere from 50 to 98. Fluorescent lamps with low CRI have phosphors that emit too little red light. Skin appears less pink, and hence "unhealthy" compared with incandescent lighting. Colored objects appear muted. For example, a low CRI 6800 K halophosphate tube (an extreme example) will make reds appear dull red or even brown. Since the eye is relatively less efficient at detecting red light, an improvement in color rendering index, with increased energy in the red part of the spectrum, may reduce the overall luminous efficacy. Lighting arrangements use fluorescent tubes in an assortment of tints of white. Sometimes this is because of the lack of appreciation for the difference or importance of differing tube types. Mixing tube types within fittings can improve the color reproduction of lower quality tubes. Some of the least pleasant light comes from tubes containing the older, halophosphate-type phosphors (chemical formula Ca5(PO4)3(F, Cl):Sb3+, Mn2+). This phosphor mainly emits yellow and blue light, and relatively little green and red. In the absence of a reference, this mixture appears white to the eye, but the light has an incomplete spectrum. The CRI of such lamps is around 60. Since the 1990s, higher quality fluorescent lamps use either a higher CRI halophosphate coating, or a triphosphor mixture, based on europium and terbium ions, that have emission bands more evenly distributed over the spectrum of visible light. High CRI halophosphate and triphosphor tubes give a more natural color reproduction to the human eye. The CRI of such lamps is typically 82–100. A typical "cool white" fluorescent lamp utilizing two rare earth doped phosphors, Tb3+, Ce3+:LaPO4 for green and blue emission and Eu:Y2O3 for red. For an explanation of the origin of the individual peaks click on the image. Several of the spectral peaks are directly generated from the mercury arc. This is likely the most common type of fluorescent lamp in use today. Halophosphate phosphors in these lamps usually consist of trivalent antimony and divalent manganese doped calcium halophosphate (Ca5(PO4)3(Cl, F):Sb3+, Mn2+). The color of the light output can be adjusted by altering the ratio of the blue emitting antimony dopant and orange emitting manganese dopant. The color rendering ability of these older style lamps is quite poor. Halophosphate phosphors were invented by A.H. McKeag et al. in 1942. Peaks with stars are mercury-lines. The spectrum is nearly identical to a normal fluorescent lamp except for a near total lack of light below 500 nanometers. This effect can be achieved through either specialized phosphor use or more commonly by the use of a simple yellow light filter. These lamps are commonly used as lighting for photolithography work in cleanrooms and as "bug repellent" outdoor lighting (the efficacy of which is questionable). There is typically only one phosphor present in a blacklight lamp, usually consisting of europium-doped strontium fluoroborate, which is contained in an envelope of Wood's glass. Fluorescent lamps come in many shapes and sizes. The compact fluorescent lamp (CFL) is becoming more popular. Many compact fluorescent lamps integrate the auxiliary electronics into the base of the lamp, allowing them to fit into a regular light bulb socket. In US residences, fluorescent lamps are mostly found in kitchens, basements, or garages, but schools and businesses find the cost savings of fluorescent lamps to be significant and rarely use incandescent lights. Tax incentives and building codes result in higher use in places such as California. In other countries, residential use of fluorescent lighting varies depending on the price of energy, financial and environmental concerns of the local population, and acceptability of the light output. In East and Southeast Asia it is very rare to see incandescent bulbs in buildings anywhere. Some countries are encouraging the phase-out of incandescent light bulbs and substitution of incandescent lamps with fluorescent lamps or other types of energy-efficient lamps. In addition to general lighting, special fluorescent lights are often used in stage lighting for film and video production. They are cooler than traditional halogen light sources, and use high-frequency ballasts to prevent video flickering and high color-rendition index lamps to approximate daylight color temperatures. Fluorescent lamps convert more of the input power to visible light than incandescent lamps, though as of 2013 LEDs are sometimes even more efficient and are more rapidly increasing in efficiency. A typical 100 watt tungsten filament incandescent lamp may convert only 5% of its power input to visible white light (400–700 nm wavelength), whereas typical fluorescent lamps convert about 22% of the power input to visible white light. The efficacy of fluorescent tubes ranges from about 16 lumens per watt for a 4 watt tube with an ordinary ballast to over 100 lumens per watt with a modern electronic ballast, commonly averaging 50 to 67 lm/W overall. Most compact fluorescents above 13 watts with integral electronic ballasts achieve about 60 lm/W. Lamps are rated by lumens after 100 hours of operation. For a given fluorescent tube, a high-frequency electronic ballast gives about a 10% efficacy improvement over an inductive ballast. It is necessary to include the ballast loss when evaluating the efficacy of a fluorescent lamp system; this can be about 25% of the lamp power with magnetic ballasts, and around 10% with electronic ballasts. Fluorescent lamp efficacy is dependent on lamp temperature at the coldest part of the lamp. In T8 lamps this is in the center of the tube. In T5 lamps this is at the end of the tube with the text stamped on it. The ideal temperature for a T8 lamp is 25 °C (77 °F) while the T5 lamp is ideally at 35 °C (95 °F). Typically a fluorescent lamp will last 10 to 20 times as long as an equivalent incandescent lamp when operated several hours at a time. Under standard test conditions general lighting lamps have 9,000 hours or longer service life. The higher initial cost of a fluorescent lamp compared with an incandescent lamp is usually more than compensated for by lower energy consumption over its life. A few manufacturers are producing T8 lamps with 90,000 hour lamp lives, rivalling the life of LED lamps. Compared with an incandescent lamp, a fluorescent tube is a more diffuse and physically larger light source. In suitably designed lamps, light can be more evenly distributed without point source of glare such as seen from an undiffused incandescent filament; the lamp is large compared to the typical distance between lamp and illuminated surfaces. Fluorescent lamps give off about one-fifth the heat of equivalent incandescent lamps. This greatly reduces the size, cost, and energy consumption devoted to air conditioning for office buildings that would typically have many lights and few windows. If the lamp is installed where it is frequently switched on and off, it will age rapidly. Under extreme conditions, its lifespan may be much shorter than a cheap incandescent lamp. Each start cycle slightly erodes the electron-emitting surface of the cathodes; when all the emission material is gone, the lamp cannot start with the available ballast voltage. Fixtures intended for flashing of lights (such as for advertising) will use a ballast that maintains cathode temperature when the arc is off, preserving the life of the lamp. The extra energy used to start a fluorescent lamp is equivalent to a few seconds of normal operation; it is more energy-efficient to switch off lamps when not required for several minutes. If a fluorescent lamp is broken, a very small amount of mercury can contaminate the surrounding environment. About 99% of the mercury is typically contained in the phosphor, especially on lamps that are near the end of their life. The broken glass is usually considered a greater hazard than the small amount of spilled mercury. The EPA recommends airing out the location of a fluorescent tube break and using wet paper towels to help pick up the broken glass and fine particles. Any glass and used towels should be disposed of in a sealed plastic bag. Vacuum cleaners can cause the particles to become airborne, and should not be used. 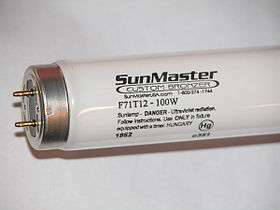 Fluorescent lamps with magnetic ballasts flicker at a normally unnoticeable frequency of 100 or 120 Hz and this flickering can cause problems for some individuals with light sensitivity; they are listed as problematic for some individuals with autism, epilepsy, lupus, chronic fatigue syndrome, Lyme disease, and vertigo. 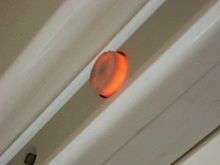 Newer fluorescent lights without magnetic ballasts have essentially eliminated flicker. Fluorescent lamps emit a small amount of ultraviolet (UV) light. A 1993 study in the US found that ultraviolet exposure from sitting under fluorescent lights for eight hours is equivalent to one minute of sun exposure. Ultraviolet radiation from compact fluorescent lamps may exacerbate symptoms in photosensitive individuals. The ultraviolet light from a fluorescent lamp can degrade the pigments in paintings (especially watercolor pigments) and bleach the dyes used in textiles and some printing. Valuable art work must be protected from ultraviolet light by placing additional glass or transparent acrylic sheets between the lamp and the art work. Fluorescent lamps require a ballast to stabilize the current through the lamp, and to provide the initial striking voltage required to start the arc discharge. This increases the cost of fluorescent light fixtures, though often one ballast is shared between two or more lamps. Electromagnetic ballasts with a minor fault can produce an audible humming or buzzing noise. Magnetic ballasts are usually filled with a tar-like potting compound to reduce emitted noise. Hum is eliminated in lamps with a high-frequency electronic ballast. Energy lost in magnetic ballasts was around 10% of lamp input power according to GE literature from 1978. Electronic ballasts reduce this loss. Simple inductive fluorescent lamp ballasts have a power factor of less than unity. Inductive ballasts include power factor correction capacitors. Simple electronic ballasts may also have low power factor due to their rectifier input stage. Fluorescent lamps are a non-linear load and generate harmonic currents in the electrical power supply. The arc within the lamp may generate radio frequency noise, which can be conducted through power wiring. Suppression of radio interference is possible. Very good suppression is possible, but adds to the cost of the fluorescent fixtures. Fluorescent lamps operate best around room temperature. At much lower or higher temperatures, efficacy decreases. At below-freezing temperatures standard lamps may not start. Special lamps may be needed for reliable service outdoors in cold weather. In applications such as road and railway signalling, fluorescent lamps which do not generate as much heat as incandescent lamps may not melt snow and ice build up around the lamp, leading to reduced visibility. Fluorescent tubes are long, low-luminance sources compared with high pressure arc lamps, incandescent lamps and LEDs. However, low luminous intensity of the emitting surface is useful because it reduces glare. Lamp fixture design must control light from a long tube instead of a compact globe. The compact fluorescent lamp (CFL) replaces regular incandescent bulbs. However, some CFLs will not fit some lamps, because the harp (heavy wire shade support bracket) is shaped for the narrow neck of an incandescent lamp, while CFLs tend to have a wide housing for their electronic ballast close to the lamp's base. Fluorescent lamps using a magnetic power line frequency ballast do not give out a steady light; instead, they flicker at twice the supply frequency. This results in fluctuations not only with light output but color temperature as well, which may pose problems for photography and people who are sensitive to the flicker. Even among persons not sensitive to light flicker, a stroboscopic effect can be noticed, where something spinning at just the right speed may appear stationary if illuminated solely by a single fluorescent lamp. This effect is eliminated by paired lamps operating on a lead-lag ballast. Unlike a true strobe lamp, the light level drops in appreciable time and so substantial "blurring" of the moving part would be evident. In some circumstances, fluorescent lamps operated at the power supply frequency (50 or 60 Hz) can also produce flicker at the same frequency itself, which is noticeable by more people. This can happen in the last few hours of tube life when the cathode emission coating at one end has almost run out, and that cathode starts having difficulty emitting enough electrons into the gas fill, resulting in slight rectification and hence uneven light output in positive and negative going AC cycles. Power frequency flicker can also sometimes be emitted from the very ends of the tubes, if each tube electrode produces a slightly different light output pattern on each half-cycle. Flicker at power frequency is more noticeable in the peripheral vision than it is when viewed directly, as is all flicker (since the peripheral vision is faster—has a higher critical frequency—than the central vision). Near the end of life, fluorescent lamps can start flickering at a frequency lower than the power frequency. This is due to a dynamic instability inherent in the negative resistance of the plasma source, which can be from a bad lamp, a bad ballast, or a bad starter; or occasionally from a poor connection to power. New fluorescent lamps may show a twisting spiral pattern of light in a part of the lamp. This effect is due to loose cathode material and usually disappears after a few hours of operation. Electromagnetic ballasts may also cause problems for video recording as there can be a so-called beat effect between the periodic reading of a camera's sensor and the fluctuations in intensity of the fluorescent lamp. Fluorescent lamps using high-frequency electronic ballasts do not produce visible light flicker, since above about 5 kHz, the excited electron state half-life is longer than a half cycle, and light production becomes continuous. Operating frequencies of electronic ballasts are selected to avoid interference with infrared remote controls. Poor quality (or failing) electronic ballasts may have insufficient reservoir capacitance or have poor regulation, thereby producing considerable 100/120 Hz modulation of the light. Fluorescent light fixtures cannot be connected to dimmer switches intended for incandescent lamps. Two effects are responsible for this: the waveform of the voltage emitted by a standard phase-control dimmer interacts badly with many ballasts, and it becomes difficult to sustain an arc in the fluorescent tube at low power levels. Dimming installations require a compatible dimming ballast. These systems keep the cathodes of the fluorescent tube fully heated even as the arc current is reduced, promoting easy thermionic emission of electrons into the arc stream. CFLs are available that work in conjunction with a suitable dimmer. The disposal of phosphor and particularly the toxic mercury in the tubes is an environmental issue. Governmental regulations in many areas require special disposal of fluorescent lamps separate from general and household wastes. For large commercial or industrial users of fluorescent lights, recycling services are available in many nations, and may be required by regulation. In some areas, recycling is also available to consumers. Systematic nomenclature identifies mass-market lamps as to general shape, power rating, length, color, and other electrical and illuminating characteristics. Blacklights are a subset of fluorescent lamps that are used to provide near ultraviolet light (at about 360 nm wavelength). They are built in the same fashion as conventional fluorescent lamps but the glass tube is coated with a phosphor that converts the short-wave UV within the tube to long-wave UV rather than to visible light. They are used to provoke fluorescence (to provide dramatic effects using blacklight paint and to detect materials such as urine and certain dyes that would be invisible in visible light) as well as to attract insects to bug zappers. So-called blacklite blue lamps are also made from more expensive deep purple glass known as Wood's glass rather than clear glass. The deep purple glass filters out most of the visible colors of light directly emitted by the mercury-vapor discharge, producing proportionally less visible light compared with UV light. This allows UV-induced fluorescence to be seen more easily (thereby allowing blacklight posters to seem much more dramatic). The blacklight lamps used in bug zappers do not require this refinement so it is usually omitted in the interest of cost; they are called simply blacklite (and not blacklite blue). The lamps used in tanning beds contain a different phosphor blend (typically 3 to 5 or more phosphors) that emits both UVA and UVB, provoking a tanning response in most human skin. Typically, the output is rated as 3–10% UVB (5% most typical) with the remaining UV as UVA. These are mainly F71, F72, or F73 HO (100 W) lamps, although 160 W VHO are somewhat common. One common phosphor used in these lamps is lead-activated barium disilicate, but a europium-activated strontium fluoroborate is also used. Early lamps used thallium as an activator, but emissions of thallium during manufacture were toxic. The lamps used in phototherapy contain a phosphor that emits only UVB ultraviolet light. There are two types: broadband UVB that gives 290–320 nanometer with peak wavelength of 306 nm, and narrowband UVB that gives 311–313 nanometer. Due to its longer wavelength the narrowband UVB requires a 10 times higher dose to the skin, compared to the broadband. The narrowband is good for psoriasis, eczema (atopic dermatitis), vitiligo, lichen planus, and some other skin diseases. The broadband is better for increasing Vitamin D3 in the body. Grow lamps contain phosphor blends that encourage photosynthesis, growth, or flowering in plants, algae, photosynthetic bacteria, and other light-dependent organisms. These often emit light primarily in the red and blue color range, which is absorbed by chlorophyll and used for photosynthesis in plants. Lamps can be made with a lithium metaluminate phosphor activated with iron. This phosphor has peak emissions between 675 and 875 nanometers, with lesser emissions in the deep red part of the visible spectrum. Deep blue light generated from a europium-activated phosphor is used in the light therapy treatment of jaundice; light of this color penetrates skin and helps in the breakup of excess bilirubin. Germicidal lamps depend on the property that spectrum of 254 nm kills most germs. Germicidal lamps contain no phosphor at all (making them mercury vapor gas discharge lamps rather than fluorescent) and their tubes are made of fused quartz that is transparent to the UV light emitted by the mercury discharge. The 254 nm UV emitted by these tubes will kill germs and ionize oxygen to ozone. In addition it can cause eye and skin damage and should not be used or observed without eye and skin protection. Besides their uses to kill germs and create ozone, they are sometimes used by geologists to identify certain species of minerals by the color of their fluorescence. When used in this fashion, they are fitted with filters in the same way as blacklight-blue lamps are; the filter passes the short-wave UV and blocks the visible light produced by the mercury discharge. They are also used in some EPROM erasers. Germicidal lamps have designations beginning with G (meaning germicidal), rather than F, for example G30T8 for a 30-watt, 1-inch (2.5 cm) diameter, 36-inch (91 cm) long germicidal lamp (as opposed to an F30T8, which would be the fluorescent lamp of the same size and rating). Electrodeless induction lamps are fluorescent lamps without internal electrodes. They have been commercially available since 1990. A current is induced into the gas column using electromagnetic induction. Because the electrodes are usually the life-limiting element of fluorescent lamps, such electrodeless lamps can have a very long service life, although they also have a higher purchase price. Cold-cathode fluorescent lamps are used as backlighting for LCDs in personal computer and TV monitors. They are also popular with computer case modders in recent years. Fluorescent lamps can be illuminated by means other than a proper electrical connection. These other methods, however, result in very dim or very short-lived illumination, and so are seen mostly in science demonstrations. Static electricity or a Van de Graaff generator will cause a lamp to flash momentarily as it discharges a high voltage capacitance. A Tesla coil will pass high-frequency current through the tube, and since it has a high voltage as well, the gases within the tube will ionize and emit light. 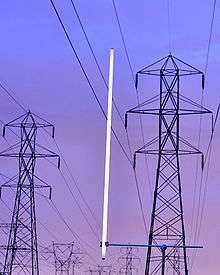 Capacitive coupling with high-voltage power lines can light a lamp continuously at low intensity, depending on the intensity of the electrostatic field, as shown in the image on the right. ↑ "Mercury-containing Lights and Lamps as Universal Waste". Washington State Department of Ecology. Retrieved 11 June 2016. ↑ "Mr. Moore's Etheric Light. The Young Newark Electrician's New And Successful Device.". New York Times. October 2, 1896. Retrieved 2008-05-26. Paid access. ↑ Gaster, Leon; Dow, John Stewart (1915). Modern illuminants and illuminating engineering. Whittaker & Co. pp. 107–111. 1 2 3 Bright, Arthur A., Jr. (1949). The Electric-Lamp Industry. MacMillan. Pages 221–223 describe Moore tubes. Pages 369–374 describe neon tube lighting. Page 385 discusses Risler's contributions to fluorescent coatings in the 1920s. Pages 388–391 discuss the development of the commercial fluorescent at General Electric in the 1930s. ↑ Weeks, Mary Elvira (2003). Discovery of the Elements: Third Edition (reprint). Kessinger Publishing. p. 287. ISBN 978-0-7661-3872-8. ↑ Claude, Georges (November 1913). "The Development of Neon Tubes". The Engineering Magazine: 271–274. ↑ van Dulken, Stephen (2002). Inventing the 20th century: 100 inventions that shaped the world : from the airplane to the zipper. New York University Press. p. 42. ISBN 978-0-8147-8812-7. ↑ "Building Systems for Interior Designers - Corky Binggeli - Google Books". Books.google.co.uk. Retrieved 2016-06-05. ↑ "Uncle Tungsten: Memories of a Chemical Boyhood - Oliver Sacks - Google Books". Books.google.co.uk. Retrieved 2016-06-05. ↑ "Discover Lighting! History > Milestones in Lighting". Ies.org. Retrieved 2016-06-05. ↑ Kane, Raymond; Sell, Heinz (2001). "A Review of Early Inorganic Phosphors". Revolution in lamps: a chronicle of 50 years of progress. p. 98. ISBN 978-0-88173-378-5. ↑ Van Broekhoven, Jacob (2001). "Chapter 5: Lamp Phosphors". In Kane, Raymond; Sell, Heinz. Revolution in lamps: a chronicle of 50 years of progress (2nd ed.). The Fairmont Press, Inc. p. 93. ISBN 0-88173-378-4. ↑ T12 specifies the bulb's diameter in 1/8 inch units; a T12 bulb is 12×(1/8) inches or 1.5 in (38 mm) in diameter. ↑ Quick Start for Fluorescent Lights "All three of the 'FAST' (< .5 seconds) starter brands caused an audible 'BURRRRRRRP' noise in some light fittings as they started and this is an inherent problem caused by their use of the faster 'DC' heating. It is worse with higher wattage tubes and if there is any loose metal in the light fitting." ↑ "Energy Conservation Standards for Fluorescent Lamp Ballasts" (PDF). US Department of Energy. p. 31. Retrieved 29 January 2012. ↑ Corazza, A.; Giorgi, S.; Massaro, V. (October 2008). Mercury Dosing in Fluorescent Lamps. Industry Applications Society Annual Meeting. IEEE. doi:10.1109/08IAS.2008.237. 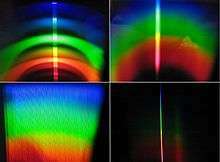 ISSN 0197-2618. ↑ Panasonic. "Panasonic Spiral Fluorescent ceiling lights, 124.3lm/W". Retrieved 2010-09-27. ↑ Klipstein, Donald L. "Light and Lighting Facts and Bits of Data!". Archived from the original on December 28, 2007. Retrieved 2007-12-29. ↑ Fink, Donald G.; Beaty, H. Wayne, eds. (1978). Standard Handbook for Electrical Engineers (11th ed.). McGraw Hill. pp. 22–17. ISBN 978-0-070-20974-9. ↑ "Compact Fluorescent Lighting" (PDF). eere.energy.gov. Archived from the original (PDF) on May 11, 2011. Retrieved 24 July 2012. ↑ "Science Fact or Science Fiction: Fluorescent Lights". Quirks and Quarks. CBC. Archived from the original on October 28, 2011. Retrieved 27 October 2011. ↑ "When to Turn Off Your Lights". U.S. Department of Energy. U.S. Department of Energy. Retrieved 28 November 2012. ↑ Fluorescent lamp cleanup Accessed 22 Apr 2009. ↑ "Working with Light Sensitivity". ↑ "Accommodation Ideas for Employees with Epilepsy". ↑ "Accommodation and Compliance Series: Employees with Lupus". ↑ Shadick NA, Phillips CB, Sangha O, et al. (December 1999). "Musculoskeletal and neurologic outcomes in patients with previously treated Lyme disease". Ann. Intern. Med. 131 (12): 919–26. doi:10.7326/0003-4819-131-12-199912210-00003. PMID 10610642. ↑ "Accommodating People with Vertigo". Archived from the original on June 8, 2008. ↑ Lytle, CD; Cyr, WH; Beer, JZ; Miller, SA; James, RH; Landry, RJ; Jacobs, ME; Kaczmarek, RG; Sharkness, CM; Gaylor, D; et al. (December 1993). "An Estimation of Squamous Cell Carcinoma Risk from Ultraviolet Radiation Emitted by Fluorescent Lamps". Photodermatol Photoimmunol Photomed. 9 (6): 268–74. PMID 1343229. ↑ Nicole, Wendee (2012). "Ultraviolet leaks from CFLs". Environmental Health Perspectives. 120 (10): a387. doi:10.1289/ehp.120-a387. ↑ Moseley, Harry; Ferguson, James (2011). "The risk to normal and photosensitive individuals from exposure to light from compact fluorescent lamps". Photodermatology, Photoimmunology & Photomedicine. 27 (3): 131–137. doi:10.1111/j.1600-0781.2011.00576.x. ↑ SCENIHR (Scientific Committee on Emerging and Newly-Identified Health Risks) (23 September 2008). "Scientific opinion on light sensitivity" (PDF). Retrieved 16 January 2016. ↑ Glozman, Stanislav; Ben-Yaakov, Shmuel (September–October 2001). "Dynamic Interaction Analysis of HF Ballasts and Fluorescent Lamps Based on Envelope Simulation". IEEE Transactions on Industry Applications. 37 (5): 1531–1536. doi:10.1109/28.952531. ↑ EPA.gov Archived January 10, 2010, at the Wayback Machine. Mercury-Containing Light Bulb (Lamp) Collection and Recycling Programs Where You Live Archived January 10, 2010, at the Wayback Machine. Bright, Arthur Aaron (1949). The Electric-Lamp Industry: Technological Change and Economic Development from 1800 to 1947. Macmillan Co.
IEEE Transactions on Circuits and Systems, Part I: Fundamental Theory and Applications 46(5), 1999 (529-544). Wikimedia Commons has media related to Fluorescent lamps. Look up fluorescent lamp in Wiktionary, the free dictionary. R. N. Thayer (1991-10-25). "The Fluorescent Lamp: Early U. S. Development". The Report courtesy of General Electric Company. Retrieved 2007-03-18.